Jackson Stewart Montgomery, son of the early pioneers Alexander and Susan Montgomery, and his wife Katherine Glockler lived here after retiring from their farm. are believed to have settled early in 1851 in a triangular area (thereafter known as the “Montgomery Sink” where the original Putah Creek disappeared into the tule swamplands to the east. Alexander (1822-1884), one of four sons of William, farmed a section of land where the present Willowbank and Oakside subdivisions are located. Alexander married Susan Martin Montgomery, originally from Fairfax County. Alexander and Susan Montgomery had fourteen children, three died in infancy. Three of their children married children of Charles Glockler: Lee Jackson Stewart married Katherine; Andrew married Katherine; and Orlena married Ed. Lee and Katherine had three children: Lee, Delbert and Mabel. ideals and life-style of early town residents. Its vernacular style relates to the close ties that Davis had to the regional rural economy of the time, before it became predominantly identified as a University town. It is not known who built this house. From the earliest memories, it seems that it was a two unit structure. Street. 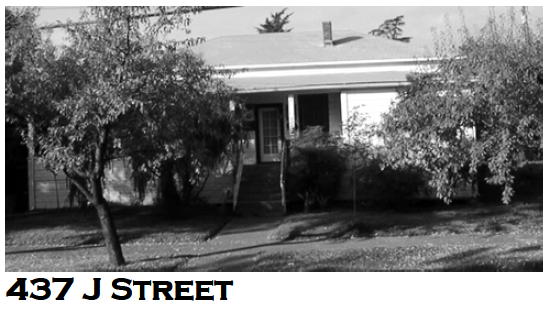 The house at 421 J Street was built for Leigh Hamilton, son of Mabel, when he got married in 1937. In September 2004, the house was proposed for demolition and to be replaced by a high density infill project. Neighbors rallied to protect the structure and the final approved project incorporates the house in the new, appropriately sized infill project. As of April 2006, the house was raised for foundation work, but a fire threatened the structure in December 2005 and an arson investigation is underway.